I love my clothes to look good and function well. That's why I've been choosing shirts, pants and even underwear made by Ex Officio. I just got back from Panama where there was 100% humidity and I was perfectly comfortable in the jungle wearing my Ex Officio long pants and long sleeve shirt. And at night when dining out, when there was still high humidity, I wore their sleeveless tops which worked perfectly well with jeans or dress pants. I choose to travel with their wickable fabrics because they don’t absorb and retain moisture easily so you stay dry as you’re racing about town or on the trail. They also dry relatively quickly when you wash them. I hand wash my wickable underwear, pants, shorts and shirt and they dry in no time. They have a great life expectancy, are comfortable, light, perform well and look great. Johnnyjet.com Visit the blog and comment on today's post for a chance to win Alaska and Seattle Toursaver books and a $50 Magellan's Travel Supplies gift certificate. 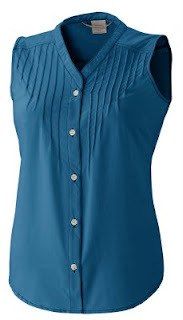 I usually think travel wear looks frumpy, but I really like the sleeveless blue top you have pictured here. I'd even wear that around town in the summer to stay cool and dry. These look great. But do they come in plus sizes? Hi marthaandme, yet, many items do come in XL. Hi Alisabow, I agree with you. In fact, I do wear many of Ex Officio's sleeveless tops around town in NYC when it gets super hot in August. They're perfect. I always end up packing so much, mainly because I never feel I have the right things. These things are great and the fact that you can hand wash them is even better. Hi sheryl, I just got back from just a few days in Panama and just about everyone except me checked huge amount so luggage. 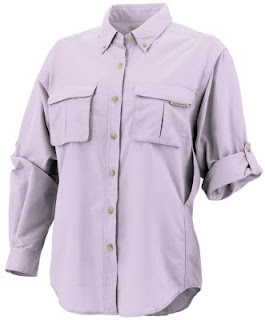 I packed one Ex Officio long sleeve shirt, one sleeveless, and one long pair of pants that zips off into shorts. (Plus their underwear.) They felt totally comfortable in the 90+ degree weather and 100% humidity. And so easy to wash in my room before dinner and they were dry by the time I returned. Ex Officio is great. The best. But be aware the sizing runs a bit small. Hi Anonymous, thanks for your comment. On the sizing, I find it only runs small on the long sleeve button shirts. The rest of the line of tops and pants runs on target, at least that's been my experience. I always find online sizing guides to be hit-and-miss - thanks for the heads up!